CFHA's headquarters for the 2018 conference will be at the Hyatt Regency Rochester Hotel. Situated along the Genesee River, newly renovated Hyatt Regency Rochester is the tallest, most upscale hotel in the Finger Lakes Area and Upstate New York. Conveniently Connected with the Rochester Riverside Convention Center, you can enjoy breathtaking views, savory restaurants, and exciting entertainment and shopping. This is your ideal destination to take in Rochester and its nearby attractions. Reservations will be accepted at the group rate until Monday, September 24, 2018. The group rate will be honored 3 days prior or 3 days after the conference, subject to room availability. Cancellation of reservations must be made 24 hours prior to arrival in order to avoid a charge for the first night. Use this link to book a room CFHA 2018 Annual Conference. Transportation services are available, free of charge, upon request between Rochester International Airport and Hyatt Regency Rochester. Transportation is also available within a three-mile radius. All transportation is based upon availability between the hours of 6:00AM and 11:00PM daily. For return service to the airport, please sign up at the front desk. There is a shuttle that departs at the top of each hour for return trips. Airport taxi fares are approximately $25 each way. Taxi fares are approximately $8 each way. When you arrive in Rochester, please call 585.546.1234 or use the courtesy telephones by the baggage claim area to arrange transportation. Please contact the front desk while at the hotel for availability and to schedule a departure. The conference hotel is filling up. We have made arrangements with a back-up hotel. The Rochester Riverside Hotel is less than 500 feet from the Hyatt and is also connected to the Convention Center via a walkway. or by calling 585-546-6400, option #1. Please ask for the Collaborative Family Healthcare Association Overflow Block. 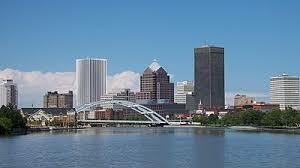 The Holiday Inn, Downtown Rochester is just over the bridge from the Hyatt and the Convention Center. The phone number is 585-546-3450. Hyatt Regency Rochester is pleased to offer guests the convenience of covered self and valet parking, with in and out privileges. Valet parking is available via the motor court entrances on East Main Street. Valet Charge: $17.00 per car, per night with in and out privileges. Hyatt Regency Rochester is connected to the South Avenue parking garage. Hyatt guests use the South Avenue parking garage, which is managed and operated by Riverside Parking. Overnight guests receive a discounted rate of $12.00 per night with in and out privileges. For credit cards, take a ticket upon entrance and pay at the exit. For cash, please utilize the payment kiosk located on level two, to the left of the elevators next to the hotel entrance, or exit via the left hand South Avenue exit.